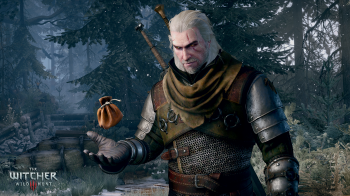 AMD's Richard Huddy says Nvidia's new "HairWorks" technology completely sabotaged The Witcher 3's performance. The eternal mudslinging between graphics card giants AMD and Nvidia continues today, with AMD claiming that Nvidia went so far as to deliberately sabotage recently-released The Witcher 3's performance on AMD cards. ""We've been working with CD Projeckt Red from the beginning. We've been giving them detailed feedback all the way through. Around two months before release, or thereabouts, the GameWorks code arrived with HairWorks, and it completely sabotaged our performance as far as we're concerned," AMD's chief gaming scientist Richard Huddy told Ars Technica. "We were running well before that," he added, "It's wrecked our performance, almost as if it was put in to achieve that goal." Additionally, despite Nvidia's claims that developers have free range of their technologies source codes, Huddy says that this was not the case with CD Projekt Red and HairWorks. "I was [recently] in a call with one of the management at CD Projekt," said Huddy, "and what I heard then was that they didn't have access to the source code." HairWorks, as the name would suggest, is a kind of technology that allows games to simulate and render fur and hair (including Geralt's dynamic beard growth) realistically. AMD has its own competing technology, TressFX, which was best used in Square Enix's Tomb Raider. It's also not just AMD cards that are suffering performance drops from HairWorks, as reports are coming in that even Nvidia's GTX 980 drops down from 87.4 FPS to 62.2 FPS after turning on the feature.